Today’s Freebie Friday is contributed by Luke Frederick of Sheepish Design. He didn’t really want to promote his design services too much, but this is such a cool freebie and he’s such a great designer that I’m pushing his service for him instead. (Surprise, Luke!) Seriously, he can design almost anything for you and your ministry — from websites to Facebook landing pages to logos to Twitter backgrounds. He does high quality work. And when I asked him about his pricing yesterday while we were hanging out at a camp, he surprisingly gave very competitive quotes considering the quality of his work (like, half the cost of what I expected!). Check out his site! 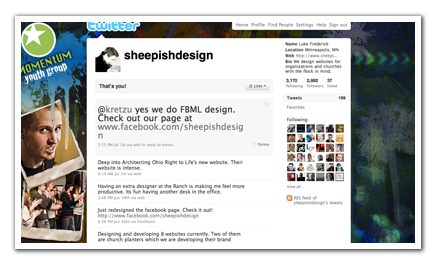 And follow Sheepish Design on Twitter. Have you ever wanted a custom Twitter background for your youth group but don’t know how to make one? Well here is a free customizable Twitter background and tutorial to walk you through the customization process. I hope this makes your student ministry look hot! If you have any questions that are not answered in the tutorial please leave a comment and I will try to answer it. Luke created this video to give you step-by-step about how to modify and customize this Twitter background using PhotoShop. It also shows you how to add the background to your Twitter page and gives you the color settings to use on Twitter to make the background look like it fades to black. NOTE: If you don’t have a copy of PhotoShop, you can download a 30-day free trial from Adobe’s website. Visit SheepishDesign.org to see Luke’s design ninjaness! Also check out a free Twitter-themed newsletter template for your youth group.